Crozier Blue is a sheep's milk blue cheese from Co. Tipperary. It is made by the Grubb family in Beechmount Farm. Sarah is now in charge of most of the operation, she is the daughter of Jane and Louis and the person responsible for making Cashel Blue and Crozier Blue available outside of Ireland. Like many second-generation cheese makers in Ireland, Sarah has set the vision of the company to expand beyond farmer's markets and sales in Ireland and England. She has been able to do this by balancing act of meeting a growing demand with a limited supply by automizing some of the procedures in making her cheese. In the case of these two gorgeous blue cheeses, the piercing of the wheels has been turn into a mechanical system and that allows for consistency in the production. This is good news for a small cheese makers, who has been gradually adapting and growing just as much as her milk production would mantain. I personally love Crozier, because unlike Roquefort it is less salty and easier to pair with food. Roquefort is the standard of comparison for blue sheep's milk cheeses, however, that comparison misses the mark as Roquefort is not only a blue cheese, it is also a cultural production that grows and develops in caves with very specific conditions. The taste of Roquefort is more mineral than Crozier, this minerality can be described as a slight tingling inside of the mouth with an after taste of salt, almost like when licking a piece of rock salt. Crozier is in turn, less mineral, maybe even more fatty and moist than Roquefort, making it a milder cheese. Goat farmers Tom and Lena Beggane were taught the art of cheesemaking by a Dutch neighbour. They started making Clonmore at their farm in the heart of Cork hurling country, Newtownshandrum, outside Charleville, in the late 1990s. It is handmade using milk from their tiny, free range herd of goats. The Begganes are at the heart of the new wave of lesser known Irish cheesemakers who have broken away from the classic Irish washed rind tradition to explore other styles. The Begganes’ goats are fortunate enough to enjoy some of the finest grazing in the heart of the Golden Vale. This pasture, more usually associated with dairy farming, lends wonderful richness to their cheese. Tom and Lena are part of that dying breed of Irish cheesemakers who are still involved in the maintenance of their own herd. The majority of Irish farmhouse cheesemakers nowadays prefer to buy their milk from one or two well-trusted local sources. The combination of farming and cheesemaking is extremely demanding in terms of time and patience. Anyone still willing to commit themselves wholeheartedly to both should be greatly admired. The Begganes also run their herd in coincidence with the animals’ natural lactation cycle, allowing the goats to dry out at the end of November and resuming cheesemaking in March. This is a less profitable, more labour intensive business model but ultimately results happier animals and higher quality cheese. Clonmore is a small, gouda shaped cheese with a beige waxed exterior and a bone white paste that is intermittently freckled with small holes. At its best the cheese is milky on the palate with a mild tang that gently gives way to the unmistakable rounded, goaty finish that typifies Clonmore. It is neither sharp nor soapy yet presents a distinctive and smooth flavour. Clonmore is one of those cheeses that is better served below room temperature. It has a tendency to become slightly oily if unrefrigerated. It partners well with scaled down wines. Enjoy with a traditional Chablis or a good Sauvignon Blanc from the Loire. This is undoubtedly one of the rarer Irish cheeses. In all of my international food travels with the export department of Neal’s Yard, I’ve never seen it outside Ireland. I therefore highly recommend that you call into Sheridans Cheesemongers for a sample next time you’re visiting! Thanks to Lucy for this collaboration. You can follow her on twitter at @lucymoylan. 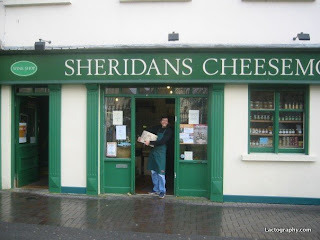 She is also the mastermind behind Sheridan’s Cheesemongers online presence @SheridansCheese. When not mongering cheese knowledge, Lucy works as a translator (Irish-English) and soon she will be a great ambassador for her country!